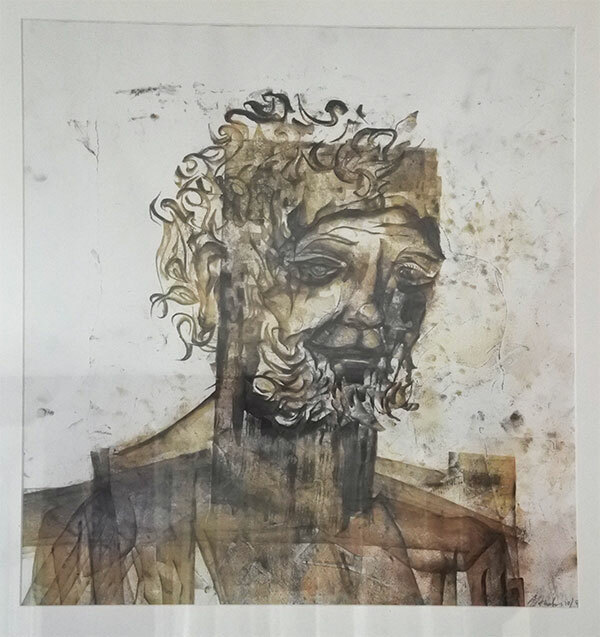 Matthew Monahan is an American artist who exhibits in many galleries and museums including the Museum of Contemporary Art in Los Angeles, the center of contemporary art of Xiamen in China and also in cities like Amsterdam, London or Mortagne! Works of Matthew Monahan can be drawn, carved, molded or made from paper, wax or bronze. It suggest archaeological discoveries, remnants of past or future civilizations and very often honor the human figure. Coen and Ariane met Matthew Monahan in the early ’90s as the artist participated in De Ateliers. It is an independent artists’ institute in Amsterdam which is run by visual artists. It focuses on the artistic development of young, talented artists from within the Netherlands and abroad. During this time Matthew often came to Coen’s bar, especially to use the coin-operated phone in the basement. 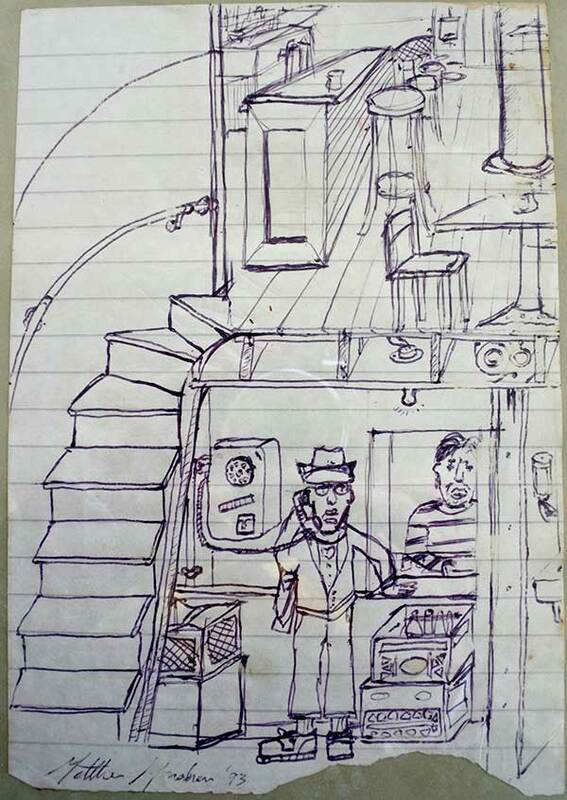 As proof, this drawing made in 1993 by the artist on which we can see him on the phone next to one of his friends who worked in the bar. It was also at this time that Coen was going to find Matthew in his atelier, after the closing of the bar late at night. In this atelier, Coen witnessed the birth of a large format drawing that immediately appealed to him. 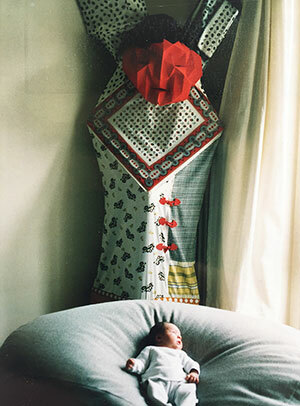 He became the proud owner,, just before the exhibition at the Stedelijk Museum in Amsterdam in 1997. Today this work is hanging in the Salle Parias Frères! Photo histoire de l’amitié entre Coen et Matthew écrite au dos de l’homme allongé. 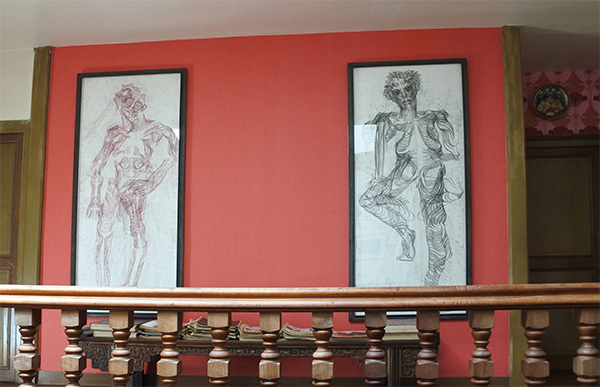 Among the works exhibited at the Domaine du Meunier, in the Appartement du Port, the portrait of a bearded character with airs of ancient divinity, also on the landing of the second floor of the Maison du Meunier, two figures, made according to the same technique of parallel lines giving at the drawing both the appearance of an anatomical study and a shamanic representation. 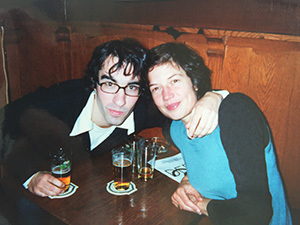 Matthew Monahan also celebrated his union with the Dutch artist Lara Schnitger at Coen’s bar in 1999, shortly before they both went to Japan for residency. 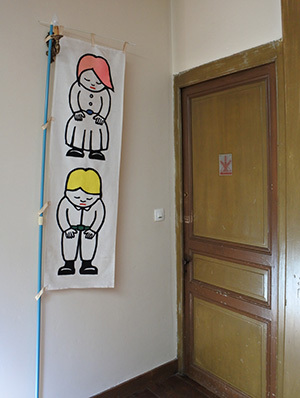 The flag with the two little figures near the door of the Chambre de la Minoterie is one of the first common works of the two artists. It is influenced by this trip in Japan and more specifically by the signs of works that deliver a message of excuse for the inconvenience caused! This cloth work also served as a sign during their first joint exhibition Gozaimas in 2000 at the Stedelijk Museum in Amsterdam. Ariane’s daughter, in 2003. Folded paper masks are very present in the work of Matthew and the head of this character shows a face made according to this process. The wooden and fabric body was designed by Lara who works a lot with these materials. It has also used a « boeren zakdoek », which could be translated as « farmer handkerchief « , which is also a fabric that is used a lot by Coen’s mum to make children’s clothes or napkins! Matthew and Lara visited the Domaine du Meunier last summer of 2017. 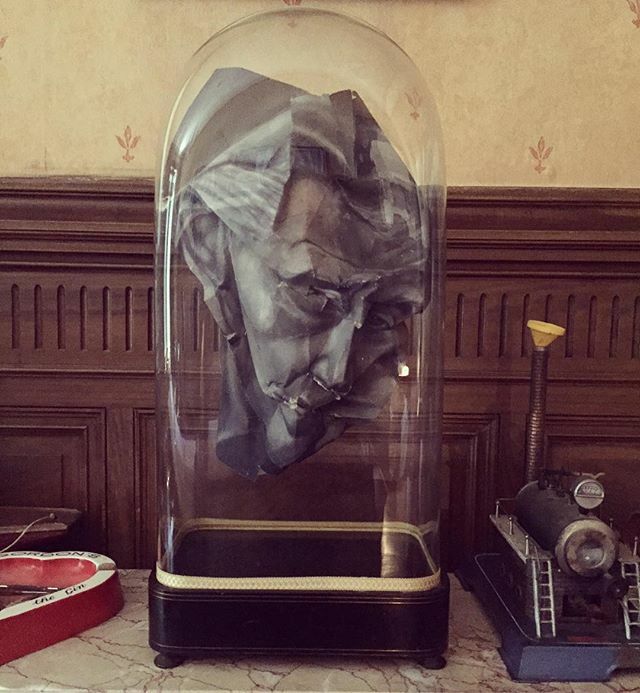 Inspired by the photo of Yves Montand, found in the Brocante de la Minoterie on the port of Mortagne, Matthew used it to create a paper sculpture that you can admire in the billiard room of the Maison du Meunier, it is called Yves Montanahan. 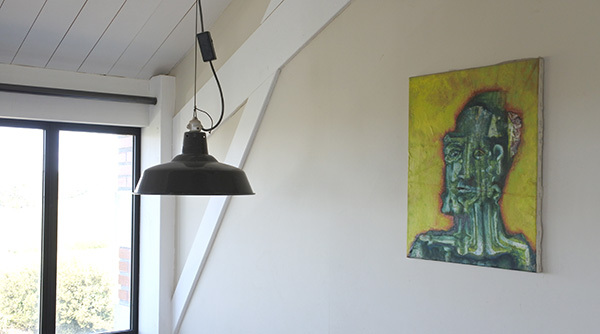 And if you are curious, during your stay, do not hesitate to ask us where the works of Matthew Monahan are hanging. You will also find books in the library, some dedicated to Matthew, others to Lara. Matthew make a solo show in September at the Anton Kern Gallery in New York. Lara performs the Suffragette City at Frieze Artfair New York from next May 3rd, and works on a public art work for the City of Sydney in Australia (opening december 2018). 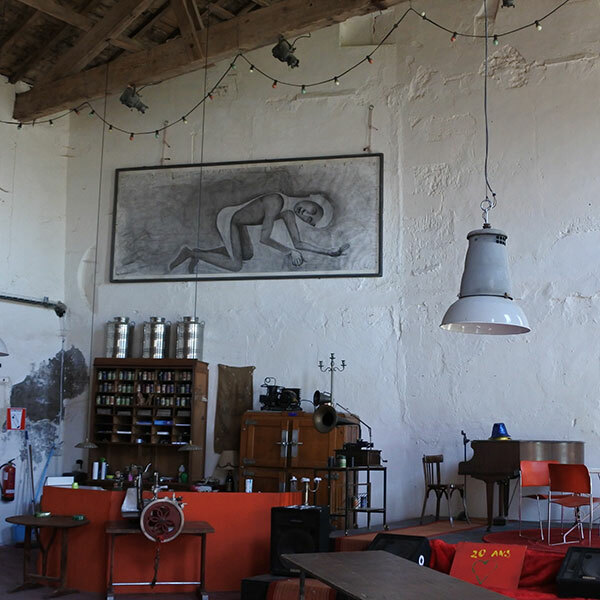 Partager la publication "Contemporary art at Domaine du Meunier"